Geographical Location : Bay of Bengal, 92° to 94° East. Longitude 6° to 14° North Latitude. Climate : Tropical and Humid. Humidity ranges between 70% and 90% with a gentle breeze blowing at all times. The weather is generally pleasant with a minimum temperature of 23°C and maximum 30°C. Altitude : Varies from sea level to 732 metre. Since pre-historic times aboriginal tribes have lived on these Islands. The Andaman group is inhabited by tribes of Negrito origin, while the Nicobar Islands are inhabited by Mongloid stock. The topography of the islands is hilly and they abound in evergreen forests. Timber is plentiful and of a vast variety. 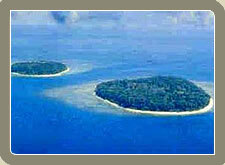 These undulating islands are covered with dense forests and endless variety of exotic flora and fauna. 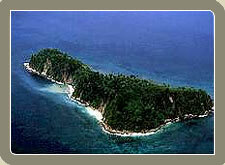 Indians : No permit is needed to Indian Nationals to visit Andamans. But visiting tribal areas of Andaman and Nicobar Districts is prohibited. To visit tribal areas of Andaman and Nicobar, Permits have to be taken by the Deputy Commissioner, Andaman District, Port Blair in special cases on receipt of application in prescribed form. Foreigners : Foreigners require a permit to stay in the islands, which can easily be obtained on arrival at Port Blair (either by Air or Sea) from the Immigration authorities for 30 days. This can be extended by 15 days with permission. In addition, permits can also be obtained from: Indian Mission Overseas, Foreigners Registration Offices at Delhi, Mumbai, Chennai, Kolkatta and the immigration authorities at the airports at Delhi, Mumbai Chennai and Kolkatta. By Air : Port Blair is connected with Chennai and Calcutta. The journey time is approximately 2hrs. Presently, flights are operated by Indian Airlines (Flights operate on Daily basis expect on Tuesdays, Thursdays and Saturdays) Jet Airways (Flights operate from and to Chennai on Daily basis). By Sea : Regular passenger ship services are available to Port Blair from Chennai, Calcutta and Vishakapatnam. There are three to four sailings in a month from Calcutta and Chennai to Port Blair. There is a single sailing from Vishakapatnam once a month.